At the Women’s Defensive Handgun Class this past weekend, we saw a most unusual sight. 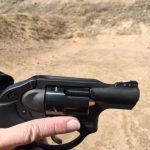 When Mary went to reload her new Ruger LCR 9mm revolver after a drill in which she only fired four times, the cylinder would not open. It took a couple of moments for us to discover the reason. A bullet was sticking out of the front of the cylinder chamber to the right of the barrel! What! Another moment of thought and we slowly tilted the barrel upward and sure enough the bullet disappeared and we were able to open the cylinder! When we pulled the moon clip out, there was the case with powder spilling out and no bullet. A little more tilt of the barrel upward and out slide the bullet! This was ammunition from a reputable manufacturer of practice ammunition. 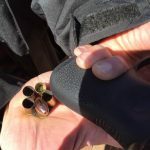 The best guess is that it was a round which was not adequately crimped and the recoil energy from firing the other four rounds jarred the bullet loose. When Mary titled the barrel downward to open the cylinder to reload (with moon clips she had to reload all five rounds at once), the loose bullet slide forward and thus prevented the cylinder from opening. Just when you think you have seen most everything the most unusual pops up!